For a small Mexican town of somewhat nondescript architecture, Jiquilpan de Juárez, in Michoacán, has considerable claim to fame, well deserving of its Magic Town status. Jiquilpan is the birthplace of two Mexican Presidents, who played pivotal roles in national affairs, and several distinguished artists. Its unprepossessing exterior appearance offers no hint of the important works of art—including sculptures and a singular mural—which are to be discovered in the town. The first former President associated with the town is Anastacio Bustamante, who had the distinction of being President three times 1830-32, 1837-39, 1839-41). In the interim between his first two governments, Mexico was forced to cede a large part of its territory, including Texas, to the USA. Bustamante, considered one of the more honest nineteenth century politicians, seized power for the first time in 1830, overthrowing Vicente Guerrero. He was in turn overthrown by Santa Anna in 1832, and fled to England. 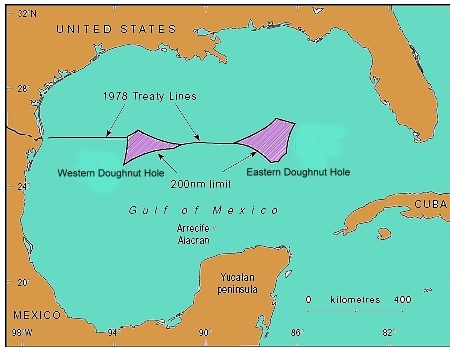 On resuming office in 1837, after the rather unsavory incidents which robbed Mexico of Texas, Bustamante immediately faced the “Pastry War” crisis. The Pastry War began when Mexico refused to pay compensation for damages to a pastry shop, owned by a Frenchman in Mexico City. The shop had allegedly been looted during riots in 1828. Ten years later, the French government used this pretext, and other losses which had occurred at the same time to other French property, to demand 600,000 dollars in damages from the Mexican government of Bustamante. 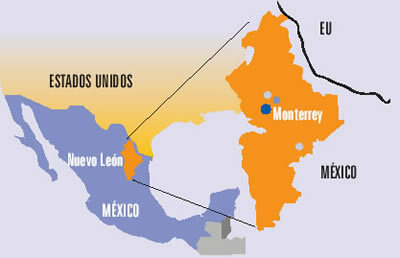 The French also sought a preferential trading agreement with Mexico. Bustamante considered the claim for looted pastries to be preposterous and refused either to pay, or to consider the trade agreement. Outraged, the French brought up a fleet from the Caribbean island of Martinique and blockaded Veracruz. Seven months later, the French added a further 200,000 dollars to their demand to cover the costs of the blockade. Bustamante finally gave in and paid in full, whereupon the French fleet sailed off. The second former President associated with Jiquilpan is Lázaro Cárdenas, born in the town on the 21st May, 1895. As national President (1934–40), he presided over a massive agrarian reform program and in 1938 nationalized the railways and the oil industry. He was the last President to be held in sufficient esteem to occupy important ministerial posts including Defense Secretary after the end of his term as President. On Jiquilpan’s main street, appropriately named Avenida Lázaro Cárdenas, are the library and the town museum. During Lázaro Cárdenas’ presidency, a nineteenth century church in Jiquilpan was converted to a library and embellished with two impressive works of art. The new door of the library, in which are sculpted the heads of 22 of the most outstanding figures of the early twentieth century, was designed by Guillermo Ruiz. It is a beautiful tribute to the greatest thinkers and scientists of the time (Edison, Marti, etc.). The murals decorating the interior of the library were painted by an even more prominent figure in the history of Mexican art: José Clemente Orozco, one of the famous “Big Three” of Mexican Muralism, alongside Diego Rivera and David Alfaro Siqueiros. Orozco painted, literally singlehandedly (having lost his left hand in a childhood accident) a series of sketchy black-and-white murals depicting political parties and revolutionary Mexico on either side of the former nave and an unusual and striking full-color, nationalistic mural known as “A Mexican Allegory”. The modern Jiquilpan museum, east of the town center beyond the very friendly Hotel Palmira, includes a collection of archaeological pieces unearthed from a nearby shaft tomb. In addition to the archaeological pieces, the museum houses the Centre for Studies of the Mexican Revolution. Even non-Spanish speakers can gain insights into the turbulent and complex times that comprise the Mexican Revolution by looking at the extensive photographic exhibition on the museum’s first floor. The exhibition details the life and works not only of Lázaro Cárdenas but also of other key figures in twentieth century Mexican politics including General Francisco Múgica, who was in the group which proposed for inclusion in the Constitution of 1917 (still current today) Article 27, which encompassed agrarian reform and land redistribution, and Article 123 which dealt with the rights of workers, including an eight-hour day and guaranteed minimum wages. The museum in Jiquilpan is a fitting tribute to these much revered politicians. Moving away from politics and towards the arts, Jiquilpan was the birthplace of artist Feliciano Béjar, who passed away in 2007, and received national acclaim for his inspiring sculptures, painting and weaving. Rafael Méndez, arguably the world’s greatest ever trumpet virtuoso, was born into a musical family in Jiquilpan and later moved to the USA. His legendary technique and tone have never been equaled. Jiquilpan hosted an international trumpet festival named for him in 2011. Elsewhere in Jiquilpan are a statue of Christ on the Cross, said to date from the times of Emperor Charles V (now in San Francisco church), and a fountain sculpted by Francisco Eduardo Tresguerras, Mexico’s most famous nineteenth century sculptor and architect. This fountain was originally on the El Cabezón hacienda, owned by the Cañedo family, in Jalisco, but the family later gave it to Lázaro Cárdenas to beautify his native town. Known as “The Fisherman’s Fountain” (Pila de los Pescadores), it is a few blocks from the main plaza. Another, newer fountain on the plaza, “La Aguadora” (The Water Carrier), commemorates the first anniversary of the nationalization of the oil industry. The ancient hieroglyph for Jiquilpan, from pre-Columbian times, is a horizontal line of earth with two indigo plants above it, linking the town to the color blue. One of Jiquilpan’s most famous poets, Ramón Martínez Ocaranza, also linked his birthplace to the color blue, christening it, “the city of jacarandas”, a tag that quickly caught on and is still used today. Anyone who drives through the town during jacaranda season (February–March) will certainly agree that the tall trees with their lavender-blue blossoms bordering the main avenues are a magnificent sight. Other Comments Off on Why Is Mexico in the OECD? The Organisation for Economic Co-operation and Development (OECD) was founded in 1961 to promote economic growth. Its current 34 members include 25 European countries along with Canada, the USA, Australia, New Zealand, Japan, South Korea, Mexico, Chile and Israel. Mexico joined the group in 1994. Four new members were admitted in 2010: Chile, Slovenia, Estonia and Israel. Russia is not yet a member but is moving toward that goal. The current Secretary General of the OECD is Mexico’s José Ángel Gurría Treviño, first appointed in 2006; his current term in this position extends to 2016. OECD member countries are among the most highly developed and wealthiest countries on the planet. Though OECD members represent only 18% of the world’s population, they account for 55% of global Gross Domestic Product (GDP), measured on a Purchasing Power Parity (PPP) basis. Among OECD members, Mexico has the lowest per capita GDP, slightly behind Chile and Turkey. In terms of the UN Human Development Index (HDI) Mexico trails all the others except Turkey. How did Mexico become a member of this very elite set of countries? As a member, Mexico fully participates in OECD discussions concerning economic, social and environmental situations, issues, experiences, policies, and best practices. OECD collects and analyzes a very wide range of data which enables Mexico to monitor its position and progress on numerous important dimensions. OECD also has numerous world class experts and committees that can assist countries on specific issues and policies. Certainly being a member of this elite group provides Mexico with an amount of international prestige. On the other hand, most development analyses and comparative OECD reports show Mexico near the bottom on most measures and rankings. Are Mexicans the world’s hardest-working people or the least productive? Is Mexico the world’s 13th or 14th largest country? Other Comments Off on Is Mexico the world’s 13th or 14th largest country? One would think that with satellite imagery there would be no question concerning the land area of countries. However, when talking about area there are some definitional issues. Are we talking about “land area” or “total area” which includes land area and inland water bodies such as lakes, reservoirs and rivers? This can be important when talking about the relative size of countries. Without question Russia is the largest with nearly twice the area of the second place country. What are the second, third and fourth place countries? 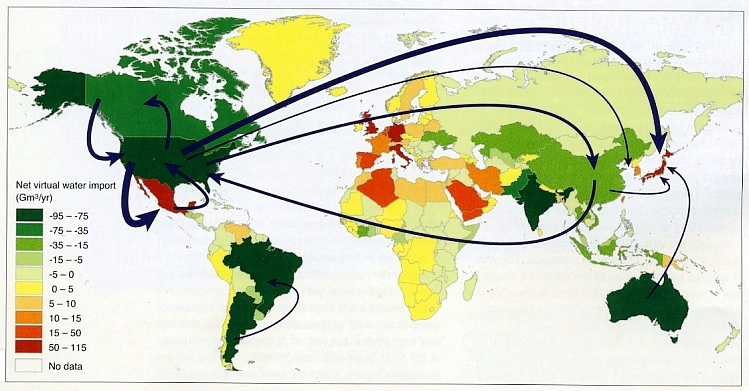 If we are talking about “land area”, excluding inland waters, then China is second (9.570 million square kilometers), the USA is third (9.162m sq km) and Canada is fourth (9.094m sq km). However, when inland waters are included to get “total area” then Canada is second (9.985m sq km), China is third (9.597m sq km) and the USA is fourth (9.526m sq km). Generally “total area” is the measure used to compare the geographic areas of countries (see table). Generally we might expect a country’s geographic area rank to stay the same from year to year and even decade to decade. However, this is not the case. Prior to 1991 Mexico was considered the world’s 13th largest country. However with the dissolution of the Soviet Union in 2011, Kazakhstan became an independent country ranked 9th in total area. This pushed Mexico down to 14th. When South Sudan split away from Sudan in mid 2011, the area of “new” Sudan was reduced by over 25%. This dropped Sudan from 10th to 15th on the list of the world’s largest countries. It also moved Mexico from 14th back up to 13th place on the list. Such political changes can have enormous impact on the size of countries. For example, prior to 1951 when Tibet was considered an independent country, the size of China was an eighth smaller than it is now. Mexico before 1846 was almost twice its current size and perhaps the fifth largest independent country behind only Russia, China, the USA and Brazil. Another issue concerns whether Greenland (2.166m sq km) is counted as a country. While Greenland is officially a dependency of Denmark it has been moving toward independence. In 1985 it left the European Economic Community (EEC) while Denmark remained in the EEC. Greenland has its own Parliament and Prime Minister; in June 2009 Greenland assumed self-determination with Greenlandic as its sole official language. If/when Greenland becomes officially an independent “country” it will be the world’s 12th largest, bumping Mexico back into 14th place. Until this happens, Mexico remains the world’s 13th largest country. The changes in rank discussed above came about for political reasons. They did not involve any physical changes. With global warming and rising sea levels some countries will actually become geographically smaller. However these changes will not affect the area ranking of the 20 largest countries for at least the next hundred years. 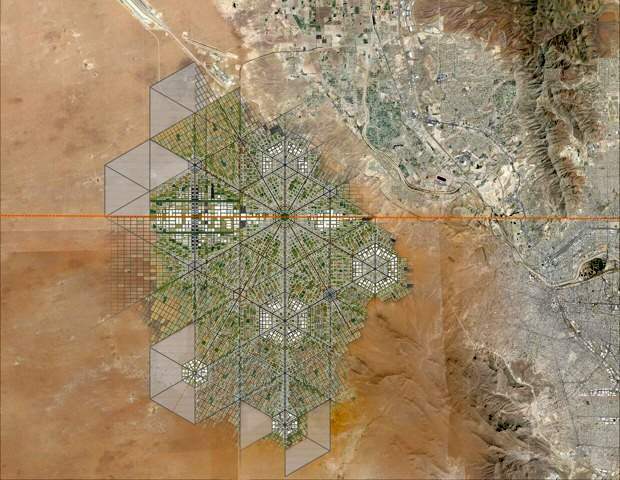 Other Comments Off on Will the mighty Colorado River ever reach its delta? A few months ago, we highlighted the outstanding work of photographer Peter McBride. McBride traveled the length of the Colorado River from its source high in the Rocky Mountains to its vast delta in the otherwise arid Sonoran desert in northern Mexico where the river emptied into the Sea of Cortés (Gulf of California). Now, McBride has released (on Yale Environment 360) a visually stunning video about his experiences tracing the Colorado River. The last third or so of the video focuses on the Colorado delta region in northern Mexico. 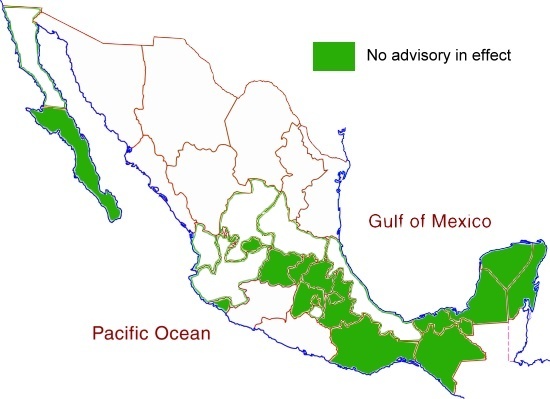 The river enters Mexico (see map below) at the Southerly International Boundary where a gauging station records the river’s discharge. Sadly, this river is one of the most altered river systems in the world.The Río Colorado delta wetlands once created ideal conditions for a rich variety of wildlife. 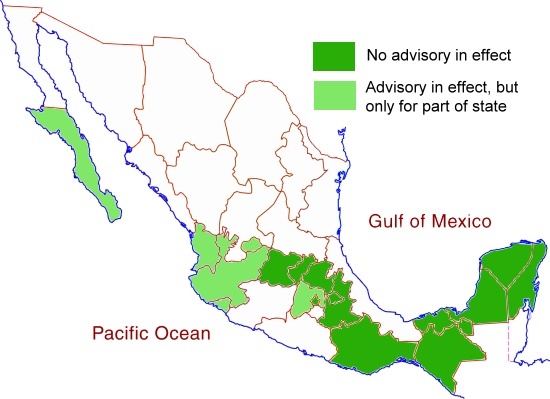 Today, the Río Colorado wetlands have been reduced to about 5% of their original extent, and the potential water supply for the rapidly-growing urban centers of Mexicali, Tijuana, Tecate and Rosarito has been compromised. 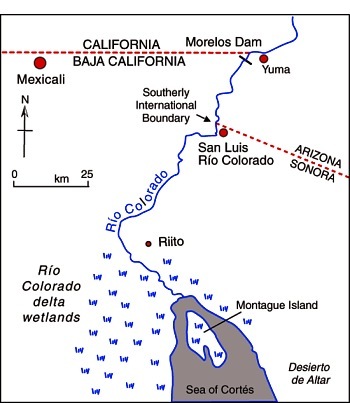 Map of the River Colorado delta. All rights reserved. Click to enlarge.